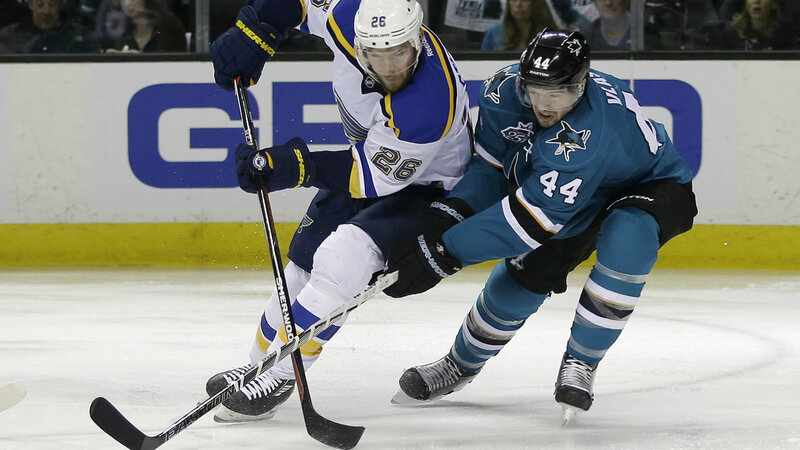 SAN JOSE, Calif. -- Troy Brouwer and Kyle Brodziak each scored twice, Jake Allen stopped 31 shots in his first start of the postseason and the St. Louis Blues bounced back from consecutive shutout losses to beat the San Jose Sharks 6-3 on Saturday to even the Western Conference final at two games apiece. Coach Ken Hitchcock hoped the change in goalie would spark his dormant offense and the move paid off as the Blues controlled the play from the start of Game 4. Martin Jones, who became the first Sharks goalie ever with consecutive playoff shutouts, was pulled midway through the second period after allowing four goals on 19 shots. James Reimer allowed one goal on seven shots in his first action of the playoffs. Joe Pavelski set a San Jose franchise record with his 10th goal of the postseason. Chris Tierney and Melker Karlsson also scored in the third for the Sharks, but it wasn't enough as San Jose went 0 for 5 on the power play and allowed a short-handed goal. There was some cause for concern for St. Louis. Captain David Backes did not play in the final two periods and the Blues did not disclose what injury he had. Brodziak struck again a few minutes later off a pass from Dmitrij Jaskin and the Blues cruised to the win that has them the closest they have been to the Stanley Cup final since losing a seven-game conference final to Calgary in 1986. The changes paid dividends as the Blues got off to a fast start. They hemmed the Sharks in their own zone with a strong forecheck and took a 2-0 lead after one. Brouwer opened the scoring after Brent Burns was sent off for tripping, beating Jones with a one-timer off a feed from Fabbri to end St. Louis' scoreless drought after 156:59. The Blues added to the lead following a turnover by Paul Martin in his own zone. Jones robbed Fabbri with a spectacular stick save but Lehtera was right there to knock in the rebound for his second goal of the series.